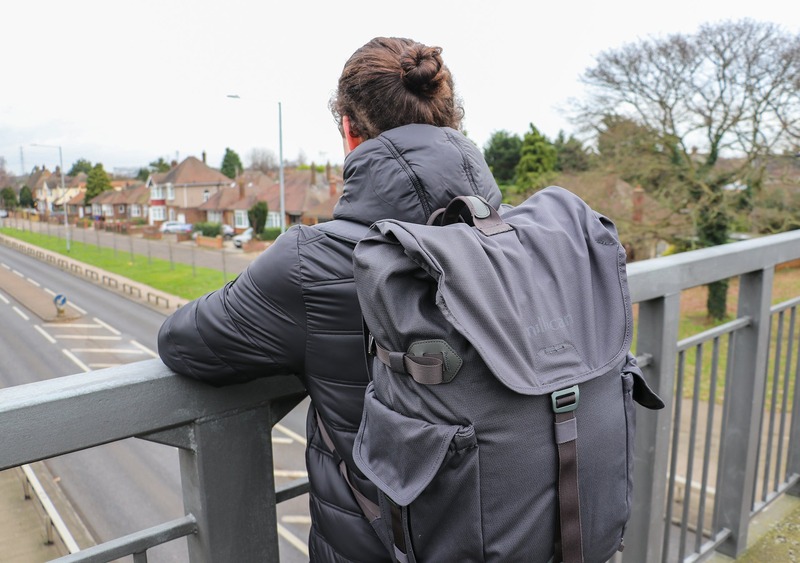 We’ve been testing this backpack for the last three months and it’s seen use as a one bag travel pack on a trip around the UK, a daypack full of tech gear to work from coffee shops, and a gym bag thrown in the trunk of a car. 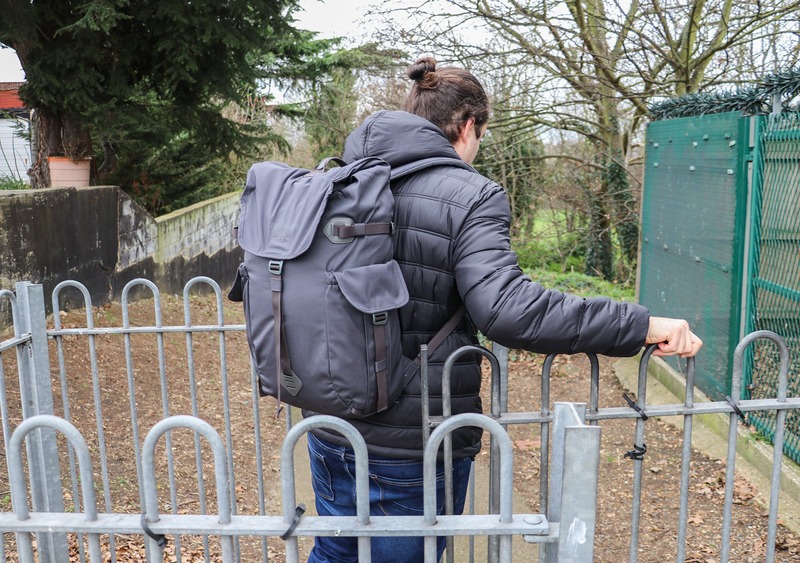 So, how well did the Fraser Rucksack 32L perform in the real world? Let’s dive in and find out! We’re digging the heritage style of the Millican Fraser Rucksack 32L, and our Instagram poll showed that 65% agreed with us. A solid effort. Millican has kept the branding subtle on this pack, and we like it. There is a logo on the front of the bag that’s hard to spot (due to it being the same color as the pack), and a small imprinted logo on the top handle and drawstring pull-tab. 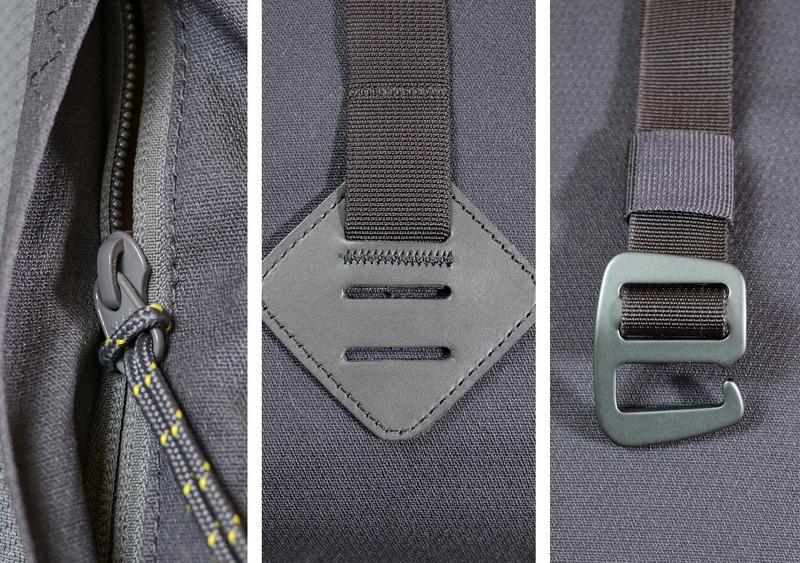 At the time of this review, the Fraser Rucksack 32L is available in graphite grey, moss (green), and slate (blue). We’re big fans of the subdued colors, and you can’t go wrong with either three. One small note is that our graphite grey pack is a lot lighter than the close-to-black color shown on the website. Millican has noted this on the product page “our Graphite Grey is a rich, natural Dark Grey, not pure Black,” and have a full disclaimer on their materials page about how the natural fibers can absorb dye differently, creating slight color variations. We’re a bit confused as to why they can’t just update the website imagery to closer match what they’re currently producing, but oh well. The disclaimer works. Now it’s time to dive into the materials, and there’s some pretty rad stuff going on here. 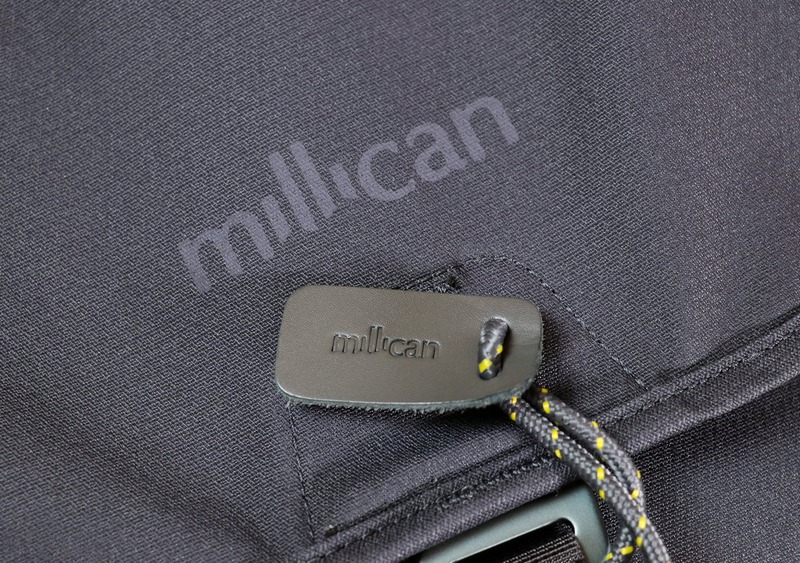 First, the outer fabric is Bionic® Canvas and exclusive to Millican. It is 38% cotton, 57% recycled polyester, and 5% high tenacity polyester. It’s also impregnated with 100% paraffin wax for additional weather-resistance. Millican goes deep into this fabric over on their materials page, but we’ll summarize the need-to-know details below. It’s incredibly durable and there are no blemishes or signs of wear after three months of use. It’s highly weather-resistant. We tested it by holding the bag under a fully open tap. It’s Remarkably lightweight for a canvas material, bringing this pack in at 2.85lbs. That’s lighter than the 33L Aer Travel Pack 2, 28L Arc’teryx Blade, and 30L Trakke Storr. Using recycled polyester (rather than virgin polyester) cuts energy by 50%, saves 20% on water, and reduces air pollution by 60%. The bottom line is, the Bionic® Canvas fabric is a fantastic all-rounder and it’s impressed in testing. Rounding off the materials, Millican has kept up the quality with aluminum buckles, leather accents, and YKK zippers. We can’t fault any decision here, and they really haven’t skimped on any part of this pack. It’s built to last and feels top-notch every step of the way. The shoulder straps are adjustable, and the dense foam padding provides a comfortable fit even when the bag is at full capacity. The back panel is padded for additional comfort, and it’s rigid so that it won’t slouch down your back. 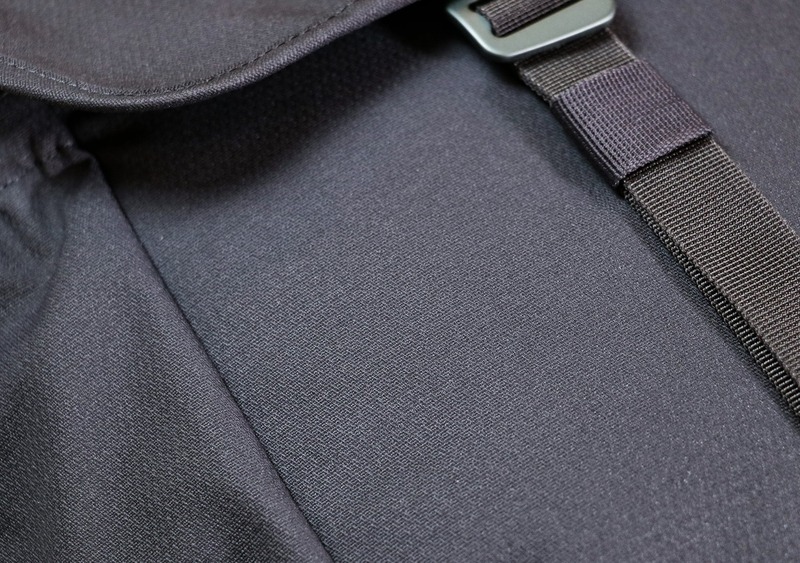 Additionally, the Fraser Rucksack 32L has a detachable sternum strap and hip belt. 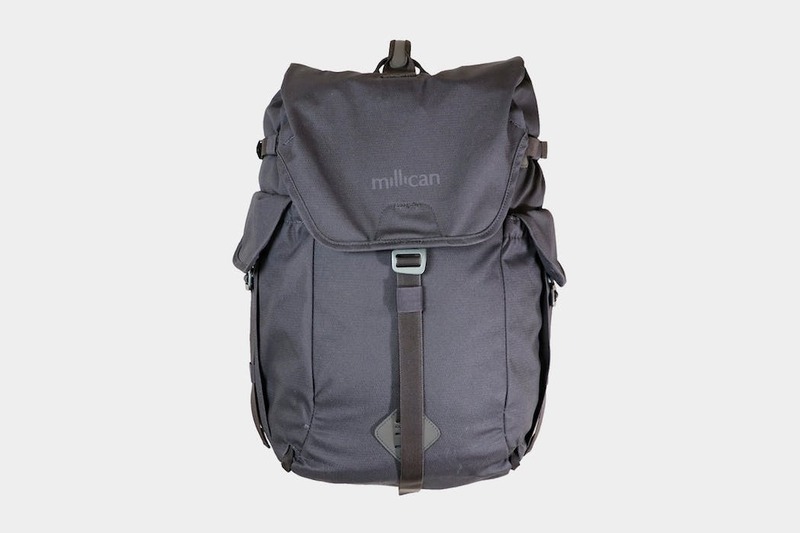 Some people won’t need the additional support, whereas others won’t consider a backpack without them, so it’s great that Millican has provided the option here. Personally, we have only been using the sternum strap and hip belt when the bag is fully loaded. The sternum strap can be attached at five different heights, and the attachment points on both sides are hidden under fabric for an aesthetic bonus. The adjustable strap secures tightly across your chest, and the aluminum buckles provide that premium feel that you just can’t get with plastic. The hip belt is attached via a pass-through panel at the back, with a patch of velcro in the middle to secure it in place. We have noticed that the front buckle takes a bit of getting used to, but it works well when you get the hang of it. And the pockets on either side are a great touch, capable of fitting a phone or compact camera for quick access. 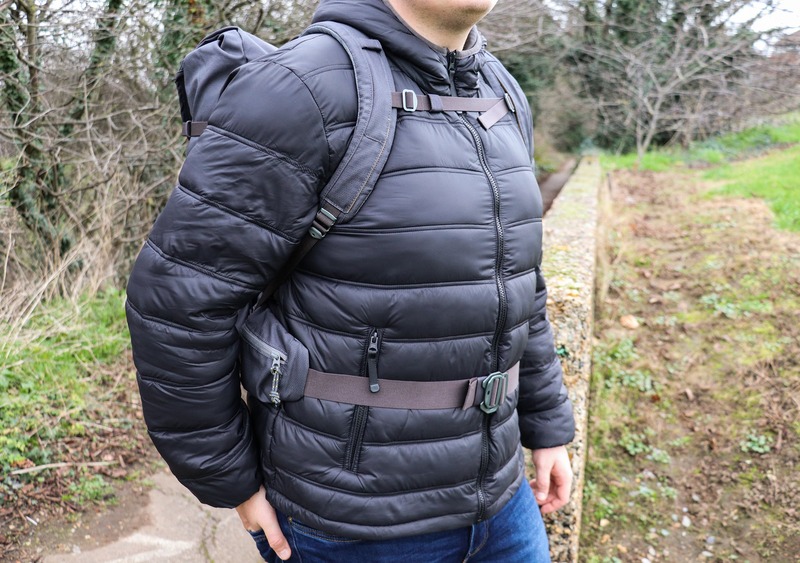 Just a note: The hip belt is fairly bulky and will get in the way if not locked in, so we’d recommend taking it off entirely if you don’t plan on using it. Next up, there are two handles on the top of this pack. The small handle at the back is good for hanging it up, and the larger one in front is a nifty quick-grab handle you can use in a pinch. 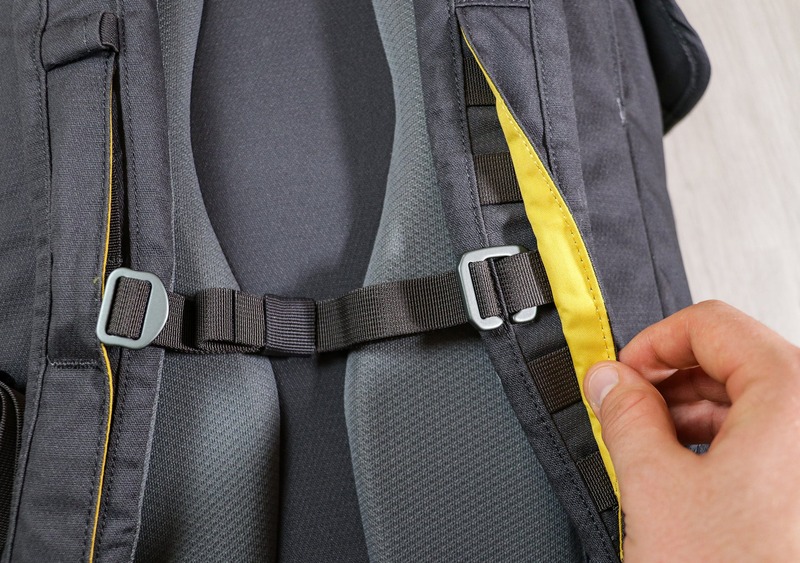 There are compression straps on each side that can cinch down the top when the pack isn’t at full capacity, and they can also be used to attach a tripod or other longer items to the outside. 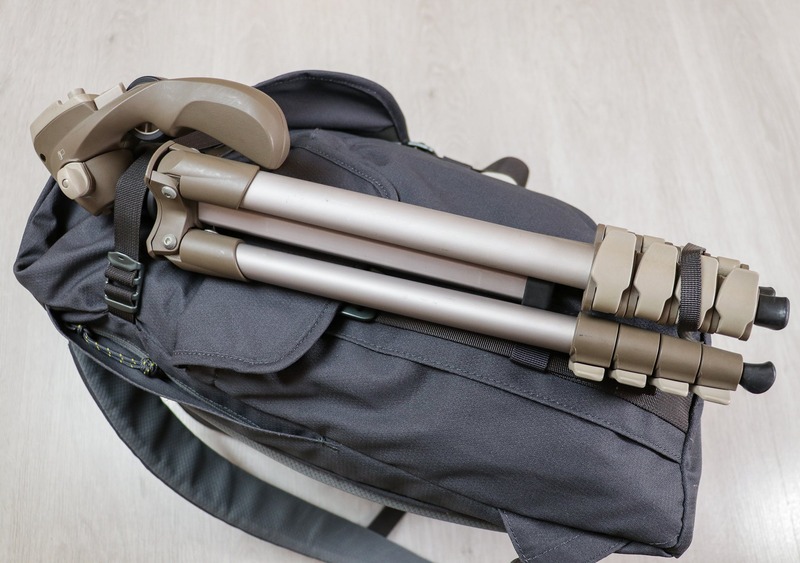 Additionally, there is a lash strap you can pull from the bottom of the bag that helps secure the feet of a tripod, specifically. One thing we must note is that there are a lot of dangling straps on this thing. Millican has added strap keepers that help a bit, but the straps are so long it doesn’t stop them from dangling completely. 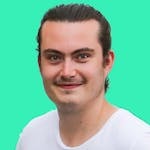 It’s not the biggest issue, but it is annoying. Definitely not a #danglefreeexperience. Before we dive inside the main compartment, there are a few external pockets to cover. First, there are two large pockets on either side of this pack. 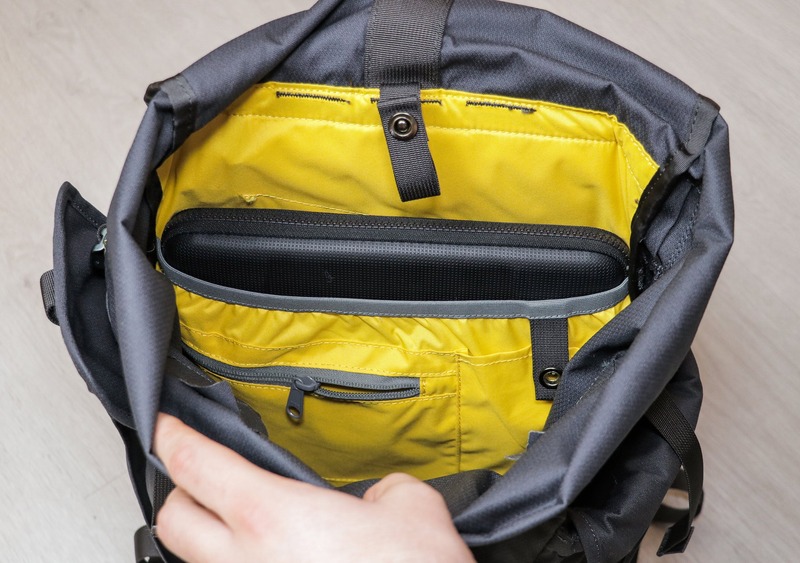 The front pocket is secured with a buckled lid and the back is an open sleeve. Both stretch down to the bottom of the bag and are excellent locations to store quick-grab items when you’re on the go. 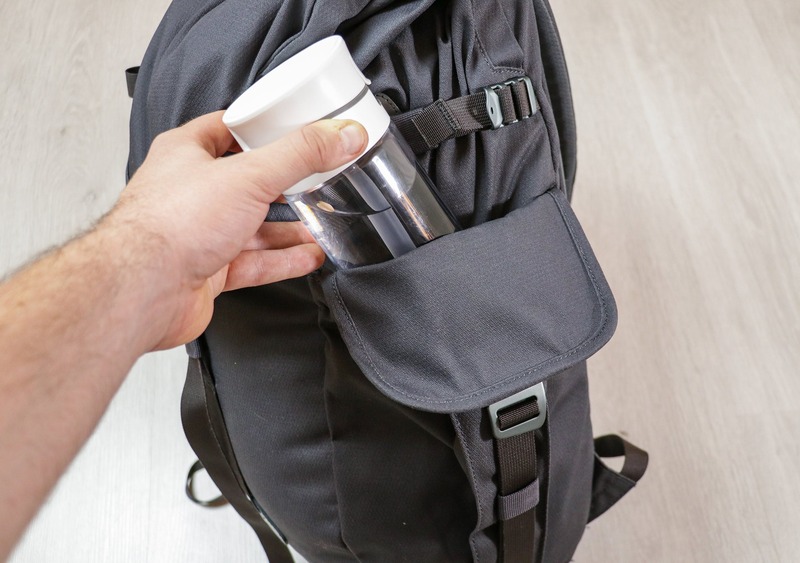 The back sleeve compartment is perfect for a water bottle, and the front pocket is ideal for earbuds, phone chargers, and anything else you may need quick access to. 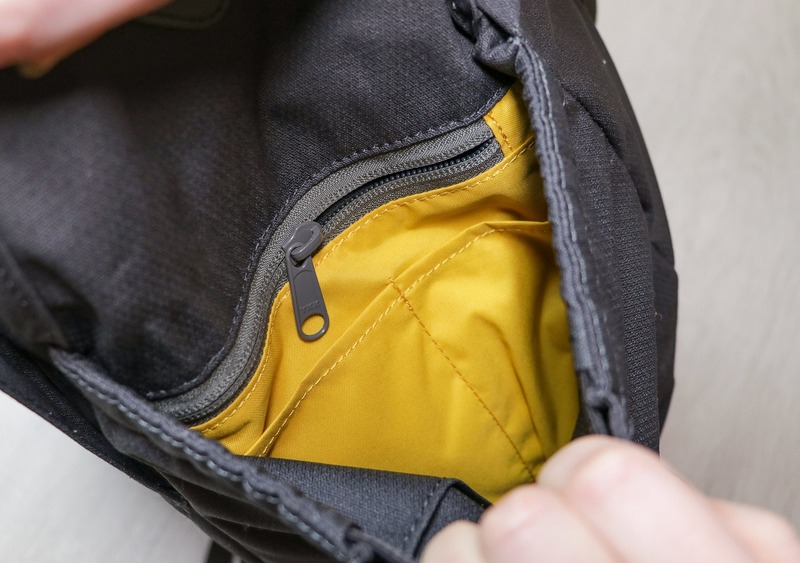 There is some internal organization inside the left front pocket as well—a thin zippered compartment with two smaller dividers on top. 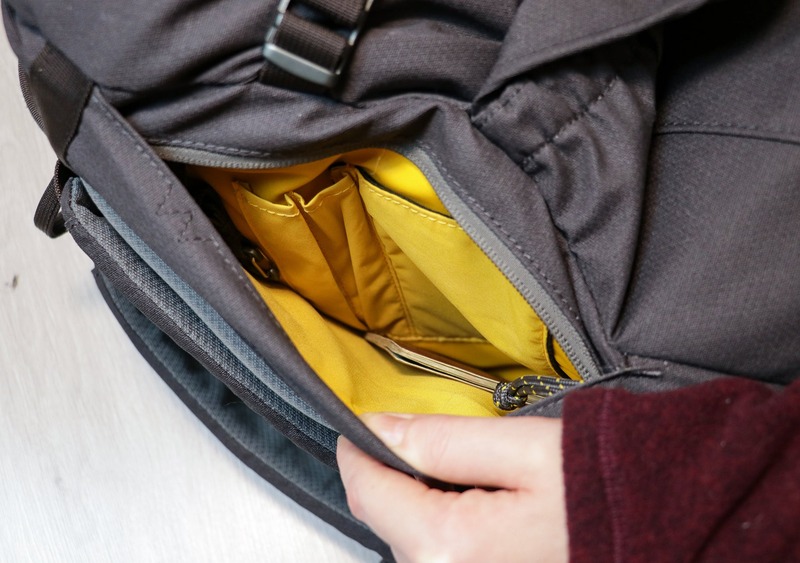 While we didn’t find ourselves using these pockets too often, the zippered compartment can add another layer of security for valuable items. Plus, they don’t get in the way when not in use. Second, there is a zippered quick-grab pocket hidden along the right side of the back panel. There’s a surprising amount of space, and it’s a clever addition. There is a small amount of internal organization here too; with an aluminum key clip, a felt-lined pocket, and two pen-sized pockets. This sleek pocket is a great place for your passport and other must-have travel essentials like your wallet and phone. Moving on to the main compartment, the top-loading opening is made of a drawstring closure and a lid that secures with a g-hook. 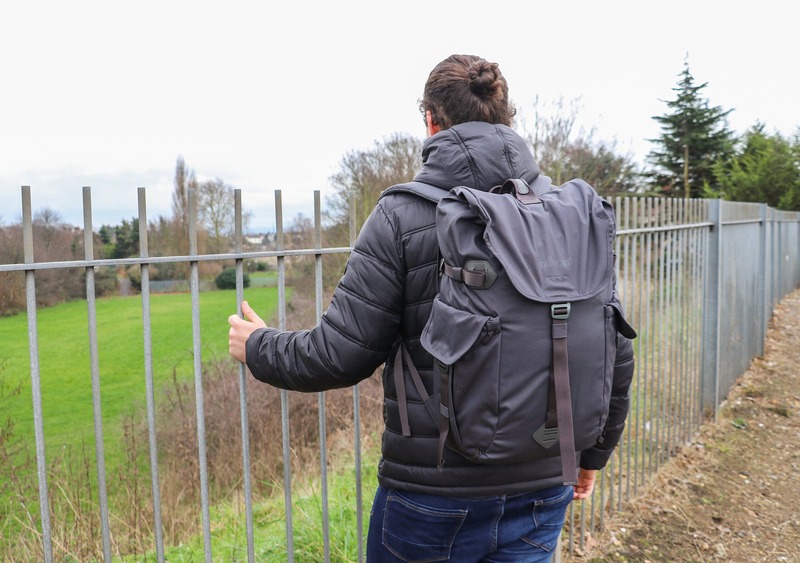 We can say that the Millican Fraser Rucksack 32L isn’t the quickest pack to open, and the g-hook takes a bit of getting used to—but we think the whole system works well as far as toploading backpacks go. Plus, the benefit of being able to adjust the capacity by cinching the top further down (or higher up) is not to be sniffed at. 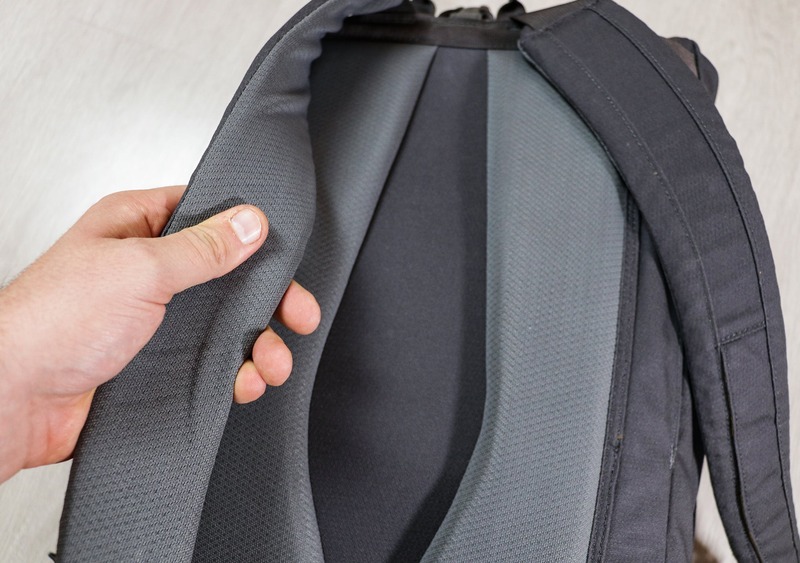 Inside the main compartment, you’ll find a sleeve at the back designed for a laptop or water bladder. 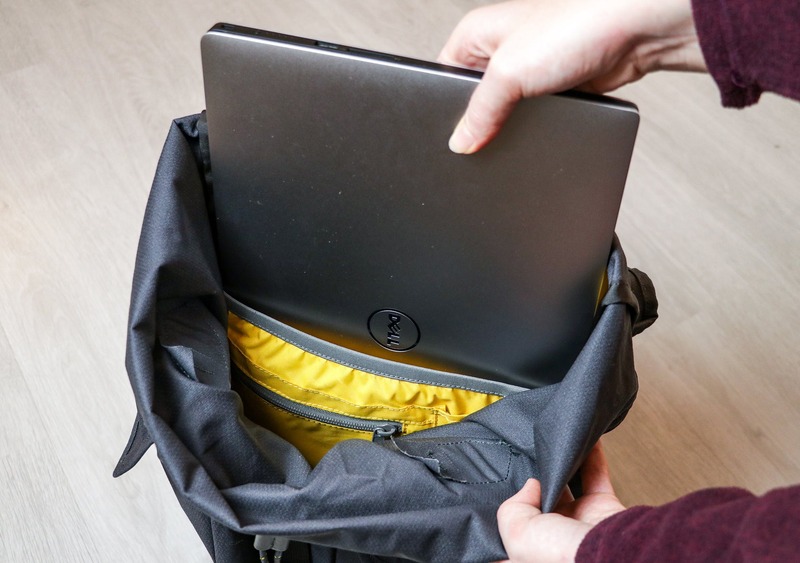 This will hold a 15” laptop comfortably, but we’d recommend putting your laptop in a protective sleeve since there’s no padding. And there’s a clipped loop and a pass-through hole for the water bladder if that’s more your style, although in our travels we usually prefer a water bottle. 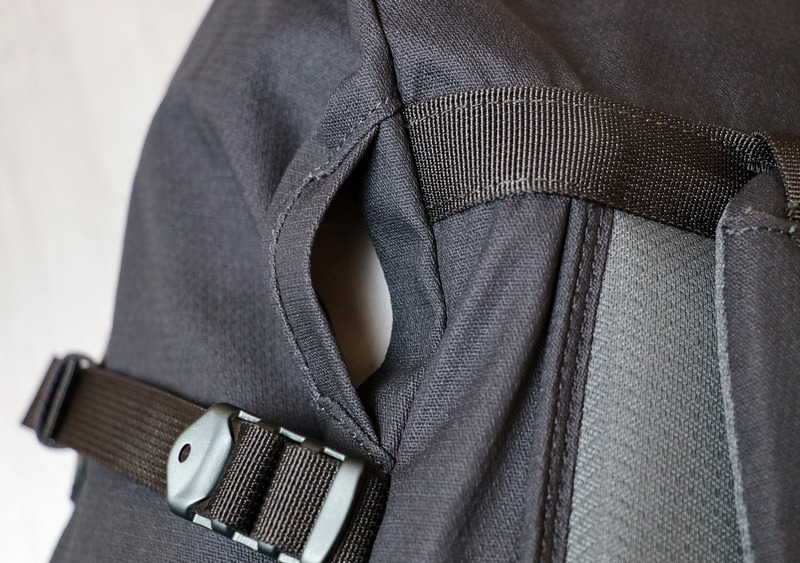 One small note is that the pass-through hole is precisely that—it’s a straight-up hole in the backpack. And while the fabric is tight, there is a possibility that water could find its way through in a downpour. And what’s directly beneath that hole in the backpack? That’s right, the laptop compartment. Not good. We’d like to see Millican tweak the design here and rotate the opening clockwise, so the fabric covers the top as opposed to the side. There are two pockets on the front of this sleeve, one zippered, and one secured with a clip. These can be useful for storing smaller items that would otherwise get lost inside the main compartment, but we found them hard to access. This is because they are so far down from the top opening, and even though the yellow color helps with visibility, it’s still tough to see (and feel) what’s going on. The rest of the main compartment is essentially a large bucket. And because of this, we’d strongly recommend picking up a few packing cubes to organize and compartmentalize the pack. 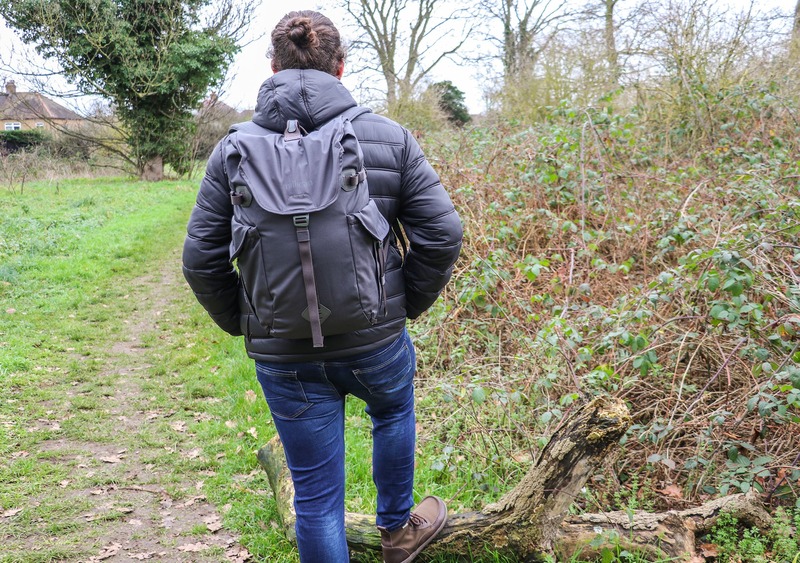 At the time of this review, we’ve been testing the Millican Fraser Rucksack 32L for three months. During that time it’s seen use as a one bag travel pack, a daypack, and even a gym bag in the rainy and cold winter months of England. We’re happy to report this pack shows no signs of wear and tear to date, and it’s clearly built to last. With the aluminum buckles, hard-wearing Bionic® Canvas materials, and considered design as a testament to this. Additionally, if for whatever reason this pack does fail during normal use, Millican offers a “good for life guarantee,” through which they will repair, replace or refund you. While we haven’t tested this ourselves, with statements like “We stand by everything we make for life. And to us, life means life,” we’ve got no reason to believe Millican wouldn’t follow through on this. In testing, we’ve found the Fraser Rucksack 32L takes a little getting used to but repays you as a truly trustworthy companion once you do. And at 32 liters, this thing can be used as a minimal one bag travel pack while still compressing just enough to use as a daypack. Took the pack on a road trip to the southwest of England as a one bag travel pack. Comfortable backpack with a solid carry. Just started getting used to the pockets. Built to last, really impressed with durability. Still feels brand new. Highly durable and made with quality materials. Can be used as a daypack or one bag travel pack. Delivers a comfortable carry with the option to add a hip belt and sternum strap. 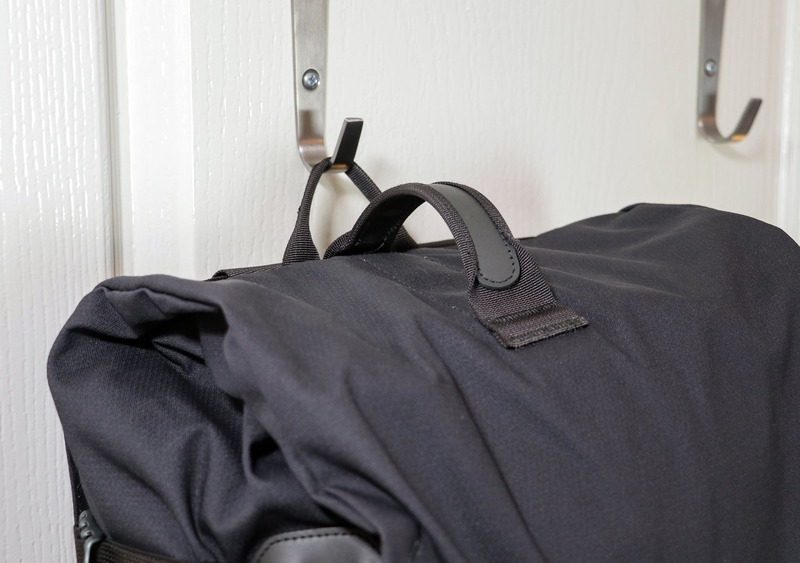 External straps can dangle and get in the way. Rain or elements could potentially leak through the water bladder hole.